Minneapolis / St. Paul and the surrounding Metro area. If you have an urgent matter that is farther away, we can discuss the details. Cost For My Service: I work on a reward basis, whatever you feel its worth for me to search and find your lost valuables (If Found Only). I do ask for a $10.00 fee for gas coverage to and from the site. If Scuba is needed, we will have to discuss a price to cover those costs. All land and water, Scuba certified. I have been searching for lost relics 20 plus years. I have found many Historic coins, tokens, tools, weapons, jewelry and more. My main mission in metal detecting is to get those articles back to the owner if at all possible. I also work with the local Historical Society. I,100%, recommend Darrin for your lost treasure searches! Thanks again, Darrin!! There is nothing better than enjoying a fun holiday weekend boating and relaxing with family and friends, but a simple exchange of a ring turned into an extremely stressful situation. While sitting on the back of the boat my friend asked if she could try on my ring. At the time, not thinking anything about it I slipped the ring off and handed it over. Now it gets interesting! It's funny how little ones have a fascination with everything shinny so when my friend went to hand back the ring her daughter asked if she could see it and give it back to me. Who knew she had the right arm of a major leaguer! She threw the ring at me, it bounced off my hand and into the lake it went, six feet deep and over a foot of silt, and we couldn't find it. Now what to do? 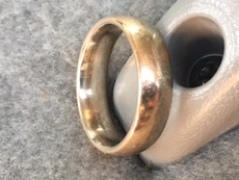 We conjured up several ideas as to how to retrieve the ring but the reality was we needed someone with the proper equipment and experience to help us out. A few call's later and thanks to the internet and the research of another friend we found The Ring Finder website. My Husband called Darrin Gray and gave him all the specifics. Darrin made note of all that was discussed and was eager and willing to get things rolling first thing in the morning. Dawn broke and everyone was already up waiting in anticipation. Darrin and his partner arrived as promised. They surveyed the drop zone, gathered their equipment and began the search. Much to our amazement about thirty minutes later there it was sitting on top of a large scoop of black muck, my ring. The Ring Finder reacted promptly to our request and were extremely professional in their approach. We can't thank them enough!